Having a healthy and beautiful lawn isn’t hard if you know how! Follow these tips and tricks from DealDash to improve your lawn. Do you ever look at your neighbor’s lawns and wonder how they are so green and lush, and yours is so…yellow and whithered? I know that I did, our lawn last year was really in need of some help. So over the winter I did a little research, and I have implemented some simple changes that has my lawn looking better than ever this year. Here are some handy lawn tips, from DealDash. One of the big mistakes that I was making with my lawn last year was I was giving it a quick watering every day. Experts say that to have your lawn looking it’s best it’s a better practice to water your lawn less often – but much more heavily than you might think. This year, instead of giving a light watering every day, I am giving it an absolute soaking 2-3 times per week depending on how hot and sunny the weather is that week. Aim for about 2 inches of water all over the lawn, which is the equivalent of a very heavy rainstorm. This might sound like common sense, but as a first-time homeowner, I didn’t realize that you were not supposed to water the lawn during the middle of the day. It’s a much better to water in the evening after the sun is on its way down. If you water in the morning or during the middle of the day, the water is just going to evaporate and not reach down to the roots. Of course, if the morning or the middle of the day are the only times that you’re able to water, then water then, just keep in mind that you should try to water extra deeply. This tip is too late for this summer, but thinking ahead to the fall, don’t rake your leaves! Instead, run them over with the mower and leave them there. The leaves will provide excellent mulch for your lawn, and lets you do less work. Now that’s what I call win-win! Speaking of wins, after you’re done taking care of your lawn, it’s time to head on over to DealDash and snag a few auction wins! Finally, thanks a lot for reading the newest DealDash article on taking care of your lawn. Be sure to come back every day for new articles on this blog as well as on our sister blog, DealDash Tips. If you have any requests for specific articles, please write a comment down below. If you are shopping for a mower, weed eater, shovel, or other lawn items, check DealDash first. DealDash has it all! Visit DealDash now. DealDash wants to help you appreciate nature. Good luck and happy bidding everyone! This entry was posted in Uncategorized and tagged Deal Dash, DealDash, DealDash Auction, dealdash auctions, dealdash.com, garden, home, house, lawn, summer, yard on June 30, 2017 by . There are many small changes that you can make in your life to make it amazing. Here are some small life improvements that you can make, from DealDash. When thinking about your life there are lots of big changes that you can probably think of to make your life amazing. However, there are also lots of small changes that you can make in your daily life that won’t take much effort but will improve your life in many ways. Read on for more information from DealDash. Do you have something big you want to accomplish such as losing 50 pounds, learning a new language, or something else? The thought of such lofty goals can be a little overwhelming. However, if you can chop up these big goals into smaller ones it’s not so daunting. For instance, making a small change such as cutting out all drinks except for water can go a long way in your weight loss goal. If learning a new language is your big goal, how about downloading some podcasts or music in the language of your choice that you can listen to on your commute? Before you know it you’ll be recognizing some of the more common words and understanding more than you did before. I bet there are lots of little things around your house that you have been neglecting. Maybe it’s that giant pile of unopened mail, maybe it’s yard work, or maybe just dusting. If you can make a list of these small things around the house that you need to do, then go through the list and do them, you’ll feel much better. Once you see how easy it was to do these small things around the house you will be more confident in doing more and more of your goals. Think of all of those wasted hours on the computer doing nothing. Of course, feel free to check your email, win some auctions on DealDash, and chat with your friends and family. However, there are probably lots of times that you are just idly just browsing online with no particular thing in mind. Try to be cognizant of what you’re doing online and when you find yourself looking up random information that isn’t really important at that moment, turn off the computer and walk away. I bet that will free up some extra time in your day to do something more important. Thanks so much for reading this DealDash blog on improving your life. Don’t forget to check back every day for new articles here are well as on our sister blog, DealDash Tips. If you have any requests for specific articles, please feel free to leave a comment below. Ready to improve your life with wins! Check DealDash for fun items. DealDash has everything. Visit DealDash now to see how much you can save. Good luck and happy bidding everyone! This sponsored DealDash blog article was written by Dawn E, a mother of 3 who loves DealDash. Dawn was compensated for writing this blog article. Read even more at DealDashBlog.com, DealDashTips.com, or on her own blog, DawnBlogtopus. This entry was posted in Uncategorized and tagged Deal Dash, DealDash, DealDash Auction, dealdash.com, family, health, healthy, improvement, life on June 29, 2017 by . Tacos and pomegranates are delicious – why not put them together and make an awesome meal that your family will love? Read on for the recipe, from DealDash. I have always been a huge fan of tacos, but I had never even tried a pomegranate until I was 30 years old! It was definitely love at first taste, though, and I have been buying them regularly ever since. I had originally thought as a pomegranate as a stand-alone food, something to snack on like other fresh fruits like grapes. After doing a little research, though, it turns out that pomegranates are delightful in many different recipes of varying styles and tastes. 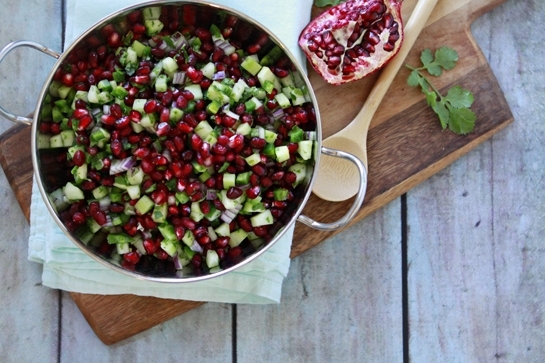 Here is just one recipe for chicken tacos and pomegranate salsa, from DealDash. Pre-heat oven to 425 degrees. Line a rimmed baking sheet with foil. In a bowl, combine the cumin, garlic, chili powders, and 1/2 teaspoon salt. Heat the oil in a medium skillet over medium heat. Season the chicken with the spice mixture you just made in the bowl and cook until browned, 2 to 3 minutes per side. Transfer the chicken to the baking sheet and roast until cooked through, approximately 8 minutes, or a few minutes longer if they are thick. While the chicken is in the oven, in a medium bowl, gently toss together the scallions, avocado, pomegranate seeds, lime juice, and 1/4 teaspoon each salt and pepper, lastly, fold in the cilantro. Slice the chicken into 1/4-inch-thick pieces. Fill the tortillas with the chicken and top with the pomegranate salsa. Serve with sour cream on the side. Doesn’t that sound delicious? If you happen to live in an area where it’s uncommon to see pomegranates in the supermarket fruits and vegetable section, then check the refrigerated section as well. They often have pomegranate seeds that have already been removed from the rind for sale. They are more expensive this way, but they are still fresh and delicious and will work well in this recipe. Thanks so much for reading this DealDash recipe. Don’t forget to check back every day for new articles here are well as on our sister blog, DealDash Tips. If you have any requests for specific articles, please feel free to leave a comment below. Try this delicious recipe, then check DealDash for kitchen items. DealDash has everything. Visit DealDash now to see how much you can save. Good luck and happy bidding everyone! This entry was posted in Uncategorized and tagged cook, cooking healthy, cooking recipe, food, healthy, kitchen on June 28, 2017 by . Using an exercise or yoga ball can be excellent for your health. Get more information from DealDash. Exercise or yoga balls are a great tool to use in your workouts at home. They provide core strengthening benefits. They can also help with balance exercises as well as gaining better everyday balance .The exercise or yoga ball creates an unstable surface and forces you to use your muscles differently to maintain your balance, this is why experts suggest replacing your computer chair with one. Here is some more information about exercise or yoga balls from DealDash. Where Can I Use an Exercise Ball? Your living room at home is the perfect place to use a yoga or exercise ball, provided that there are no sharp corners or edges that the ball could get poked on. You can also use your exercise or yoga ball in your basement, bedroom, or even your garage as long as it is free from sharp and pointy objects. There are many different exercises that you can do with your yoga ball, and there are many that are suitable for beginners. Sit on the yoga ball with your feet firmly planted on the floor. Cross your arms over your chest and lie back until you are looking at the ceiling. Return to a sitting position. There you go! One yoga ball sit up. Repeat until you have done a set of 20. Do two sets. Lie flat on the floor with the exercise ball between your feet. Squeeze your feet together and lift your legs until the ball is above you. Return your feet and the ball back to the floor. Repeat until you have done a set of 20. Do two sets. Kneel on the floor with your toes tucked underneath your feet. The yoga ball will be in front of you. Put your forearms on the ball so your arm makes a 90-degree angle. Roll yourself forward, so you are balanced on the ball in a plank position. Your body should form a straight line from your head to your heels. Hold for one second, then bend your knees and slowly roll back to the original position. Repeat 10 times. Do two sets. Thanks so much for reading this DealDash article on yoga ball exercise. Don’t forget to check back every day for new articles here are well as on our sister blog, DealDash Tips. Need new exercise equipment? Check DealDash for exercise machines, running shoes, and more. DealDash has all of the items that you need. Visit DealDash now to see how much you can save. Good luck and happy bidding everyone! This sponsored blog was written by Dawn E, a mother of 3 who loves DealDash. Dawn was compensated for writing this blog article. Read even more at DealDashBlog.com, DealDashTips.com, or on her own blog, DawnBlogtopus. This entry was posted in Uncategorized and tagged ball, Deal Dash, DealDash, DealDash Auction, dealdash auctions, dealdash.com, exercise, family, fun, health, healthy, yoga on June 27, 2017 by . Depending on what you’re making, a wok can be an excellent choice. Here are some tips and idea from DealDash for wok cooking. Wok cooking is traditionally Asian in nature, and some people might have never even used a wok. I’m here to tell you that wok cooking is fast, easy, and delicious. You can always just use a frying pan, but there are many advantages to using a wok instead. Read on for more details on wok cooking from DealDash. Firstly, and possibly most important to many people is the fact that cooking with a wok is a lot faster than using a traditional pan. The main reason that you can cook foods so much faster by using a wok is in the design. The wok has been designed to disperse the heat more effectively throughout the base of the frying pan, and as a result taking much less time to finish food preparation. Step aside, frying pan. The wok is here to school you on cooking a variety of different types of food. Sure, you can cook things like eggs and bacon in a frying pan, but in the wok, you can cook those AND so much more. Here are some examples: stir frying, steaming, deep frying, poaching, boiling, braising, searing, stewing, making soup, smoking and roasting nuts. The way the wok has been designed lends its use to pretty much any type of cooking that needs to be done, not just frying. Another reason that you get better flavors when using a wok is that of the shape of the design allows for better mixing of the ingredients. When you use a frying pan you’re very limited in your mixing abilities because of the low sides. When you use a wok you have much higher sides to work with, and therefore an easier time mixing the food as you cook it, leading to better flavor overall. Certainly, the frying pan has its place in your kitchen, but when it comes to cooking dinner, I reach for my wok every time. Thanks so much for reading this DealDash articles on the wok. Don’t forget to check back every day for new articles here are well as on our sister blog, DealDash Tips. If you have any requests for specific articles, please feel free to leave a comment below. Wok cooking is the best. Check DealDash for woks and other kitchen items. DealDash has everything. Visit DealDash now to see how much you can save. Good luck and happy bidding everyone! This entry was posted in Uncategorized and tagged cooking, Deal Dash, DealDash, DealDash Auction, dealdash auctions, dealdash.com, family, home, kitchen, wok on June 26, 2017 by .